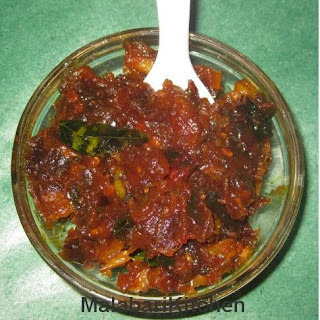 Dates are sweet by nature and are rich source of vitamin C. Below is the receipe of how to prepare dates pickle. This is best when served as a side with Biriyani. Date pickle is a sweet and lightly sour dish. =►Chop dates into small pieces (4pieces). 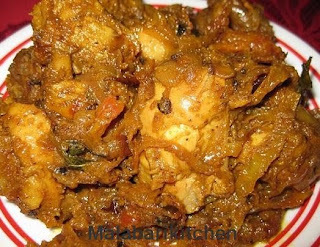 =►Heat 4tsp of oil in a pan, add mustard& fenugreek. And allow them to splutter. 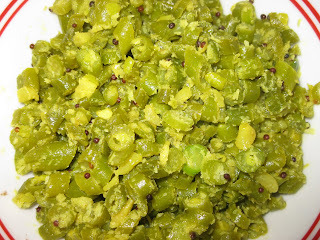 =►Add finely chopped ginger, garlic, curry leaves, dry red chilly and green chilies. =►Saute them till all the raw smell of garlic goes off. =►Add turmeric, red chilly, hing powder ,salt and 1/4cup of vinegar into it. Note: If u want loose texture, add boiled water. You like more sourness add more vinegar.